But, will you use it? Facebook Messenger is getting yet another feature today, now allowing you to share live video instantly with a friend. The new feature is called Instant Video and works, unsurprisingly, much like Snapchat's own video messaging offering. Facebook Messenger does already have a video chat feature, but Instant Video aims to get users to share tidbits of their lives instead of having a full conversation. "Instant Video is a reflection of the ubiquity of video — we simply expect to have that ability in real-time, all the time," writes Facebook in a blog post. "With Instant Video, you can bring your conversations to life in the most authentic way — seamlessly and instantly." Facebook imagines Instant Video will be used in situations where you want to quickly get your friend's opinion on a pair of shoes or need to ask a friend what ice cream flavor he or she would like. Short and sweet, and possibly actually helpful. To use Instant Video, you and a friend need to have your chat open in the Facebook Messenger app. Only then will the video button pulse, letting you know you can start an Instant Video. By default, videos show up in a window without sound, but can be enabled with a tap. Users can choose to enable their camera to show their reaction. Instant Video will show up in a small window. Both Snapchat and Facebook Messenger support sending video notes as well if you don't need an immediate response. Both services also support traditional video calling for longer conversations. Instant Video is just one of the many features Facebook hopes will keep its users from going to another chat app besides WhatsApp (Facebook owns WhatsApp). 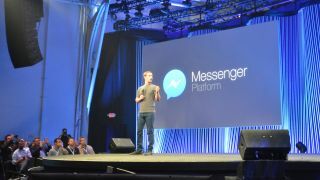 Collectively, Facebook Messenger and WhatsApp have about 2 billion active users, showing Facebook's dominance in the segment. For comparison, Snapchat has 150 million active users. Although Instant Video may not end up being a popular feature, it doesn't have to be. Facebook just has to match its competitors and leverage the massive popularity of its social network to get users talking to one another.